Waterlines and sail plan are the brainchild of the design team of Italia Yachts and Cossutti Yacht Design. They are made to ensure an incomparable navigation experience. The wide teak cockpit, folding transom and the perfect position of hardware on deck means everything is in the right place to ensure great sailing simplicity while cruising or racing. The bright and comfortable interiors, finished in precious teak wood, are the widest and richest in innovative solutions in its category. Italia 10.98 is the perfect boat for cruising or to participate in races. The 10.98 offers class-leading interior space and a more dynamic behavior in the sea, agile and safe. Italia 10.98 exterior spaces invite crew to enjoy outdoor life, sailing and at anchor. Two comfortable and large benches make up the all teack cockpit, one of the largest for its size. The deck is free from running rigging and thanks to the flush-deck hatches and portholes, it is possible to stretch out in the sun almost everywhere. Under the cockpit and stern benches are four large lockers in addition to the dedicated liferaft locker. The open cockpit is completed at the stern by a sunny, teak-covered bathing platform and swim ladder. The lightness of the boat and the powerful water lines will give you a fast sail in the lightest of airs. In more demanding conditions, excellent course holding characteristics and design rigidity together with the moderate sail plan gives you the superb, safe handling of the Italia 10.98. With a displacement of just 4.800 kg, Italia 10.98 limits its weight to the typical values of racing boats. This ambitious achievement is the result of a careful optimization of each part of the boat structure. Hull and deck are laminated in sandwich at a controlled temperature, with differentiated density PVC cores covered with vinylester resins. The bottom frame with carbon fibre reinforcements is laminated on a female mould and then glued and laminated to the hull bottom. Cruising at its best with the Italia 10.98. The cockpit is one of the largest for its size. This will make you forget the actual length of 37 feet. As a standard, the cockpit and the seats are covered with high-quality teak. Upon request, it is possible to finish the entire deck with teak. From stern to bow, there are many comfortable and flat sundeck areas. The helm’s wheel is large and very sensitive to ensure good sensations during sailing, always comfortable and safe for crew thanks to the excellent righting moment of Italia 10.98. Fast and easy to handle, even with a reduced crew. You can go sailing and have fun with an Italia 10.98 also with light winds, thanks to the extreme lightness of the boat and performing waterlines. The deck equipment is designed to ensure safe use without hampering crew movements also in heavy wind conditions. The deck is wide and free from obstacles thanks to the flush-deck hatches and portholes. The through deck jib furler, included in the standard equipment, allows the use of both cruising and racing sails. Italia 10.98 is provided by four stainless steel mooring cleats. The stainless steel anchor arm is removable and a windlass is mounted in the chain locker. All six winches are two speeds and self tailing. The standard version is provided with aluminum boom and a two spreaders mast by John Mast, with discontinuous rigging and stainless steel turnbuckles. The furling drum recessed below deck is manual with the ability to maneuver through the halyards winch. All the running rigging is made with ropes made of Dyneema® cores. 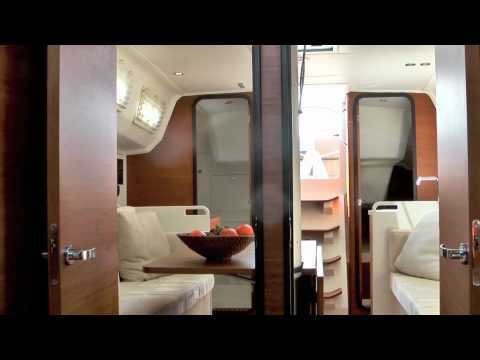 Below deck the Italia 10.98 has an impressive amount of space for in an 11 meter yacht. Both saloon and cabins have height and dimensions that create a delight for on board living. The mood is warm and welcoming, designed to create a comfortable environment. The furniture, finished in precious teak with a horizontal vein, gives a refined look to the interiors. All corners of furniture, doors and bulkheads are rounded. Wide stowage spaces and craftsmanship finishes, in leather and polished stainless steel, complete the classic and timeless mood of Italia 10.98.